About Gerry Knight and his career. Born in south London during the blitz, this is a record of Gerald (Gerry) Knight's career (name anagram "The large Knight kid"). Having documented the following it's noticeable how, having achieved a high level of professionalism in one sphere, he moved on to another. Gerry left Glastonbury school, Morden in 1962 aged 18 and at that time he didn't know what he wanted to do as a career. His main academic interest had been in Physics and Applied Mathematics so he joined the Aerodynamics division of the National Physical Laboratory (NPL), Teddington and continued his education part-time in Applied Physics later specialising in electronics, for which he obtained Institute membership and where he studied the new techniques of digital electronics, a rapidly expanding technology. Whilst at NPL Gerry was exposed to valve based computers; "Ace", the UK's second programmable machine designed there by Alan Turing and "Deuce" a later model. NPL then installed an English Electric KDF9 in the early 60s. This was a great advance being programmed using paper tape and Autocode or Algol languages. Gerry worked on jet noise ( e.g. 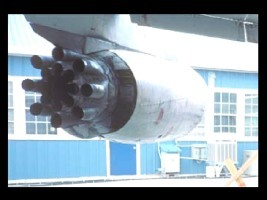 the Boeing 707 fluted nozzle ), high and low speed wing design (e.g. VC10 and helping select Concorde's beautiful shape ), wind loading on buildings (including the ill fated "twin towers" of New York), as well as fundamental turbulence research. 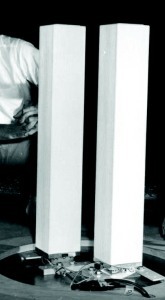 This latter work exposed him to the development of ground breaking electronic instrumentation techniques especially in hot wire anemometry, ideas subsequently marketed by DISA. In the mid-60s Gerry married Linda. Gerry had met one of his old school friends by chance and was invited to his 21st birthday celebration. There he met the friend's cousin and, as they say, the rest is history. Soon after their courtship started they found that their families had been linked for many years when previous generations were both living in the same area of south London. Both grandmothers had gone to school together, and Gerry's great uncle was best man at the wedding of Linda's aunt. There was at least one occasion when Gerry and Linda attended the same party when they were young; they were both at the same celebration party for Elizabeth II's coronation in June 1953. Linda's family took their holidays on the Isle of Wight, just off Portsmouth, and while there Linda commented that it would be a lovely place to live. The Isle of Wight is called the Dinosaur Isle. They took home the local paper, the IoW County Press, and found that there were two possible employers; Plessey Radar and British Hovercraft Corporation (BHC). Both subsequently offered Gerry a job, but the chance to help develop hovercraft, the recent invention of Sir Christopher Cockrell, meant Gerry went to Cowes, IoW, where the first full scale hovercraft, SRN1 and SRN2, had been built using the addition of a "skirt" by CH Latimer-Needham which had incresed the hover height over waves. BHC had been formed out of the Saunders Roe establishments on the IoW, then owned by Westland Helicopters. The IoW factory sites were built for the production of Saunders-Roe flying boats and they had established a research site in 1946 around a long water tank, built to test the hull and floats of Saunders Roe flying boat designs. The SR A1 jet fighter flew for the last time at the Festival of Britain in 1951 whilst the final Princess flying boat was scrapped at the end of 1967 after years being moth-balled at Cowes. Scale models were pulled along the towing tank to measure the resistance and planing characteristics. The tank, built from scrap aluminium lofting plates riveted together and suspended from two long wooden rails, was only built to last a few years but it was in use for at least 50 years as No1 tank. The IoW was used to hosting such tests. Sir William Froude built his own facility near Torquay to complete his experimental work (1870) leading to the Froude Number, the link needed to predict full scale results from model tests. But Blanch Thornecroft built her facility in 1884 at the family home in Bembridge, IoW. Gerry went to work at the Experimental site, where No1 tank was, and model tests on Donald Campbell's fateful Coniston water speed record attempt earlier in 1967 had been reproduced. Campbell was trying to raise the record above 300mph which he did on the first run, but crashed on the return leg. By this time a second much shorter tank, No2, had been added together with a closed circuit wind tunnel and several open circuit facilities. Also on the site was an advanced electronics facility specialising in strain-gauges (for which Saunders-Roe had held the patent), and harsh environment electronics. 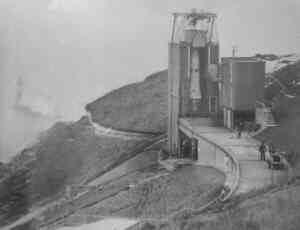 The British Black Knight and Arrow space rockets were built here, tested, tethered, at High Down, the West Wight firing ground above the Needles lighthouse, and then shipped to Woomera, Australia for launch. 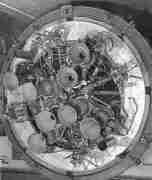 In 1971 Black Arrow launched the only British space satellite, "Prospero". The west firing pad is shown below with the Needles lighthouse in the distance.It was on the walkway, by the two people, that an accident took place during an open-day. In the usual demonstration of the HTP fuel, a spoonful was tossed onto the concrete apron where it exploded with a loud noise to the amusement of the onlookers. Health and Safety regulations were not as strict in those days, neither were insurance claims which are now so widespread. On this day however it had rained the night before and the HTP vaporised the water and blew a crater in the concrete. Needless to say the demonstrations were discontinued thereafter. For further information a link is provided to Black Arrow British rocket:"Abandoned after the first successful launch satellite" from Nick Stevens and The British Space Race, BBC 2004, PART. 1 and The British Space Race, BBC 2004, PART. 2 . The site continued on the fringes of space vehicle static testing and aircraft ditching tests, but it's main function was the hovercraft development programme. 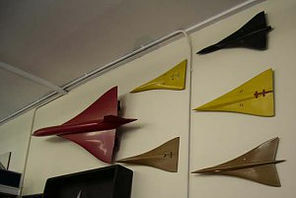 This was the first circular link in Gerry's career; the Concorde ditching tests were completed at Cowes to enable the awarding of its CAA airworthiness certificate. 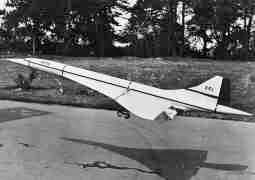 This required a radio controlled scale model Concorde to be built. It was so large that it needed Air Traffic Control clearance before launch. Strangely early Saunders Roe analogue computers were also built here in the early '60s and one was still in use at Cowes in 1967. Aerodynamic, hydrodynamic and free-flight tests using radio controlled hovercraft models were all required since nobody understood how to control these vehicles which had no contact with the ground. When Gerry arrived there was a large 6ft x 4ft radio controlled model of the proposed four propeller cross-channel N4 hovercraft which was used for demonstration purposes (shown above). It was driven by two chain-saw petrol engines and was demonstrated on the central lawn with greater or lesser control depending on the operator's experience. There were also instrumented scale models of the N5 and N6, but what was really required was a 10th scale N4 model, fully operational and fully instrumented. Although Gerry's colleagues had the instrumentation experience from the rocket work, there was no modern electronics experience. Gerry used his knowledge to build heavy duty radio control equipment based on a commercial front end. He always believed in building onto proven commercial equipment rather than designing from scratch since this "added value" principal provided the best value for money and is recognised now as COTS (commercial off the shelf). The N3,N4,N5,N6,N7 and newer advanced design free flight models were all working and generating vast quantities of data which was being hand analysed and this led to the next change in Gerry's career. About 1970 a new generation of solid-state mini-computer became available capable of real-time analogue data analysis. Miniature analogue tape recorders were available in the form of aircraft "black boxes", so Gerry set up a new department based on the latest 8KB x 16b memory machine. This internally programmed computer was housed in a 6ft equipment rack with peripheral equipment including paper tape handling. The memory was soon increased to 16KB, then a "massive" 32KB in order to provide multi-tasking. To produce a new version of the analysis programme took two eight hour shifts, one to edit and compile the FORTRAN programme and a second to load and dump the runnable version. Heady stuff ! In comparison a modern internet phone has up to 256GB x 64b (2019). That's 32 x 4 Millon times bigger. The success of the 10th scale data collection and analysis system coincided with a worldwide naval ship seakeeping problem. The British Navy had not had an undamaged ship capsize since 1545 when the Mary Rose sank just off the IoW while engaging the French in full view of the King, but the trend was now to replace heavy hulls, armament and the magazine with weapons above deck. This called into question the stability of the ship's design, especially in waves where the stability tends to be compromised anyway. Strangely the resting place of the Mary Rose was discovered about this time and she was recovered from the sea bottom ten years later in 1982. A series of 10th ( 1:10 ) scale models of Naval ships was built and tested in various sea states (Video here). This series of tests included some of the early work on semi-planing hulls leading to a proposed Rolls-Royce powered commercial "Fast-Ship", a later second loop in career. Also at this time one of the first RC helicopter models in the UK was used to assess ship landing capability in rough seas . A Leander frigate was included in the tests and strangely some of the full scale Leander Class were built at J. S. White's shipyard, Cowes in the early sixties. To complete these tests Cowes needed a tank capable of testing hulls in realistic wave conditions. Until then testing had been done in single frequency "regular" waves, or successive single cycles of different frequencies, "irregular" waves. However it had recently been acknowledged that this method of wave generation did not reproduce extreme wave height conditions, a situation needed for hovercraft testing. The half mile long No3 tank was constructed (see video below). Whilst maintaining his interest in data analysis, Gerry designed the systems to collect data from the tank model tests using infra-red laser beams, and to generate signals for the hydraulic wave-maker. This period saw the application for three patents for his designs. Two occurrences triggered the next change for Gerry's career. Firstly he was appointed as the British representative on the Information Committee of the International Towing Tank Conference ( ITTC )(secretary 1978-84), the body which guides research and agrees international standards for testing, and secondly, while testing the No3 tank wavemaker he could not make sinusoidal waves follow theory and travel the length of the tank. The committee work meant Gerry had to travel around the world to attend meetings, inspect new installations and help publish the worlds latest testing techniques thereby making many contacts. The wave effect needed detailed investigation which his contacts' organisations would do. He discovered that all the organisations with long facilities that he talked to had the same problem and each suspected their wavemakers. In all cases the waves broke up into a distinct "beating" pattern as though more than one frequency was present. Through analysis Gerry showed that energy was moving out from the generated frequency, widening into a spectrum. Generally accepted theory did not allow this spread and more mathematically minded researchers put their minds to the problem using early work by Benjamin and Feir (1967). There soon evolved a theory of how ocean wave spectra were generated, something not previously understood. A given wind creates wave frequencies around the peak of the spectrum, and the energy "drifts" to form the typical steep front, long tail shape actually measured. A special contract was awarded to this No3 tank to compare the different machines being developed around the world to harness energy from sea waves. A great deal was learned about testing in "real" wave conditions, and this contradicted some of the claims for effeciencies which were proved to be over estimated due to a mis-understanding of the incident wave energy. The site has featured in articles in the Engineering Magazine in 2001 and 2002, and was recognised in the Marine South East magazine 2009 when it closed. At this time the hovercraft business in the UK began to wane, some say "they never really got off the ground". It was beginning to be acknowledged that hovercraft only had a future as beach assault or ice craft and whilst Cowes helped with North American research and the USSR had a large fleet, the UK had little interest. A video of a pilot's view of the early hovercraft is available here from the BBC. Things were beginning to run down on the IoW and the factory was turning to legacy helicopter work from the parent company, Westlands. Gerry decided that, since he couldn't now keep up with front-line technological advances, he would offer his experience to the manufacturing industry. There followed a move to Rolls-Royce (RR) and Derbyshire. The planning of the move itself was not simple and involved a cross-Solent car journey with two adults, a child, a rabbit, two Siamese cats and a hive of bees. Gerry started at a marine RR site specialising in very high accuracy assembly using welding in the nuclear industry. There was little in the way of computing at that time; a large thermionic valve computer used for one inspection stage had just been de-commissioned and there were attempts to replace it with the new generation of laptop computer. Whilst this was a reasonable functional replacement (a typewriter size swap for a room) Gerry realised that by using a larger central computer the future potential was enormous. His installation on this one inspection stage increased the efficiency of a production bottleneck removing the need for 24 hour operation. Significant computerisation followed improving inspection speeds and data collection and retrieval. The latter was important since the product had an operational life of 20-30 years and previous solutions involved long term storage of documentation. The volume of work was such that Gerry started to supervise less experienced staff and moved on to manage computing and other document related services. After some years as a successful "people" manager Gerry took early retirement from the Marine Division of Rolls-Royce. Gerry has never been very interested in playing sport competitively although he still enjoys watching any sport played well. However, at school he was introduced to field hockey, a game he enjoyed playing. He had some skill with his reverse stick and played on the left for 26 years for his company teams, for enjoyment rather than trophies. If you like maths/logic questions try this one from 60's Scientific American. Flash videos of ship hull testing in a test tank and free flight are available here. and video of a full scale Leander frigate is compared with a tenth scale model in a rough sea. They open in a new window. Flash video of hovercraft is available here. It opens in a new window. A short video of a nuclear submarine is available here.